Create positive impact by developing new collaborative mindsets and behaviours ! Through a series of Action Learning Groups, we can facilitate small groups of leaders and managers to help each other solve workplace challenges. Using a coaching style, the process enables the group to reflect, question, support and learn from each other, leading to solutions and concrete actions. How does an action learning group work ? Learn new skills to collaborate effectively and create engagement. 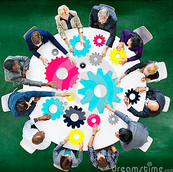 Adopt new collaborative team models to address organisational challenges.